Over the last few years I have become more laid back, spontaneous, and carefree, yet I am still what you would consider “Type A”. This also means I like to be in charge in the kitchen; I like to decide how much butter to put in the potatoes and how thinly to dice the peppers. Many times when I cook by myself I find a kind of zen—it’s my time to be alone, blast my favorite Frighten Rabbit album, and gain satisfaction from creating a good dish. Then there are those times that I over commit, forget to buy a key ingredient, run out of time, and end up with a disaster in the kitchen. On these occasions I call my friend, Barbara, and frantically ask her to run over and help me sort out my mess. Without fail Barbara brings my missing ingredients, cleans while I scramble to take a shower, and entertains our friends while I put the finishing touches on the pasta. I am ashamed to say I always ask Barbara to save the day, and rarely ask her to cook—even though Barbara is a great cook (I will have to tell you about her omelets some day!). So on Sunday I finally asked her to take the reins in the kitchen and she shared with me her family’s favorite meal, a dish called Yángcōng dàn, which literally translates into “onions and eggs“. The dish is tasty, simple, and affordable—perfect after a busy day when you’re struggling to find the energy to cook. It also gives one of my favorite supporting ingredients the chance to play a lead role: caramelized onions. 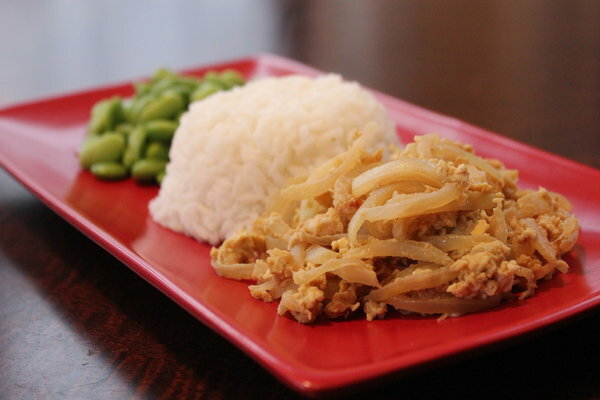 The onions are contrasted by salty soy sauce, producing a sweet and savory meal; all for less than $1.90 per serving. A delicious Asian meal and a good friend—I couldn’t think of a better way to celebrate the Chinese New Year. I am hoping Barbara will cook for me again sometime in the near future. Alex Milling is a recent graduate of Northwestern University and is hoping that the groundhog won’t see its shadow on the 2nd. In order to achieve a good sweet and salty balance Barbara recommends Yamasa soy sauce. Combine two cups water and one cup rice in a pot and bring to boil over high heat. Once water begins to boil turn down to simmer, cover, and cook for 20 minutes, or until the rice absorbs all of the water. While the rice is cooking, cover a large pan with olive oil and turn stove on medium heat. Add onions and cook until translucent (about 10-15 minutes). Once onions are translucent crack one egg into onion mixture and stir until well mixed, repeat for remaining eggs. Stir in soy sauce, a splash at a time, until mixture turns golden brown. Let cook for 5 more minutes. Serve eggs and onions next to a large pile of white rice. Dang, that sounds like a lot of soy sauce. Something I always have to watch out for is that some soy sauces are darker in color than others.. So darkness of food doesn’t correlate to how salty it’s becoming. Great point! The ‘golden brown’ test works when you use Yamasa soy sauce (orignial, not low sodium). With other soy sauces I would reccomend using about a quarter cup, there are a lot of onions and then tend to need a fair amout of soy sauce to balance the sweetness. That said, my favorite way to determine if a dish needs more salt is to taste it as I go along. Hope that helps!